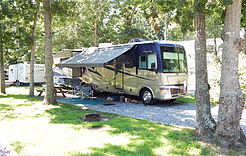 Make your Cape May getaway the best it can be with luxury camping accommodations and high quality campground amenities only found at Holly Shores Camping Resort. At Holly Shores, we go the extra mile to provide a glamping vacation you will never forget. Here’s a sample of some of the amazing Campground Amenities we have to offer. 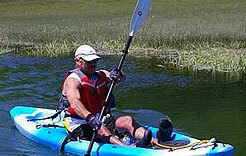 Our guests have exclusive and private use of all the amenities at Holly Shores Camping Resort. The resort is gated for your enjoyment. With 300 large shaded, full hook-up RV campground sites that can accommodate RVs up to 40 feet, you can camp in complete comfort. Campsites include free WiFi, water, electric, sewer, 20/30/50 AMP electrical service, cable, picnic table and fire ring. Each wooded RV site is shaded by mature Oak or Maple trees and is either stoned or has a concrete pad. Free WiFi is available all throughout the Holly Shores resort for all guest including RV and cabin campers. Don’t leave your furry friend behind! Holly Shores is a dog friendly campground. 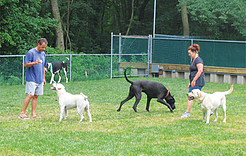 We even have a fenced in dog park so you can let your pup roam free and explore. Dive into our beautiful heated pool, complete with umbrellas and beach chairs, and a beautiful scenic waterfall. Babies and toddlers can play in our 18″ deep baby pool while you relax in our jet stream hot tub. Our activities directors have fun pool games for the kids to play everyday in the summer! Our new kid-approved playgrounds feature swing sets, jungle gyms, tether ball, picnic tables for lunch, and even a tiny house. Let your little one’s imagination run wild. Get your friends together for a game at one of our many sports courts. 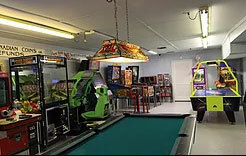 Beat the heat in our air conditioned game room equipped with pool, pin ball, air hockey and more than 10 classic arcade games. There are 4 bathhouses located throughout the park. A fully equipped laundromat with Maytag washers and gas dryers is conveniently located in Bathhouse 1. We carry everything from camping and RV essentials to Holly Shores wine glasses and shirts. Enjoy a wide variety of snacks and even made-to-order fresh-fruit smoothies and yummy milk shakes. 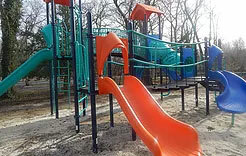 The 10.9 mile bike path and nature trail leads to Local Attractions such as historic Cold Spring Village, Cape May Zoo, and Zip Line Village. 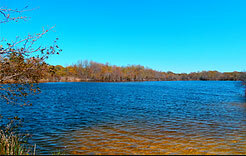 Wander down our 800-ft nature path to three fishing lakes conveniently located behind Holly Shores Camping Resort. Need a place to store your boat or RV? We’ve got you covered! A-2 Storage LLC is located a short 3 miles away from the campground, and can help with all your storage needs. We can include a listing to advertise your RV under our For Sale By Owner RVs. Just Contact Us or call the resort office at 877-494-6559 for information. 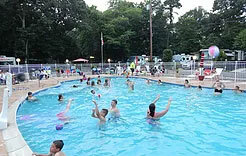 Enjoy the your Cape May, NJ vacation to the max with these top quality campground amenities. 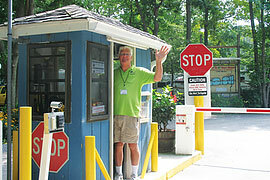 Book your Reservation with Holly Shores Camping Resort today!